A top Iranian commander has warned Saudi Arabia and the United Arab Emirates against crossing Iran’s redlines, saying if they do so, the Islamic Republic will decisively retaliate by crossing theirs. In an address to the Friday Prayer worshippers in Tehran, Islamic Revolution Guards Corps’ second-in-command Brigadier General Hossein Salami directly addressed the two regional countries, saying the storm of Iranian nation will sweep the whole region if it breaks. The general then referred to the recent terrorist attack on a military parade in southwestern city of Ahvaz which left 24 people dead and 68 others injured, and said regional and global elements played roles in the attack. “The designers of such blind strategies are affiliated with the nasty triangle of the US, Zionist regime and Saudi Arabia,” he said. 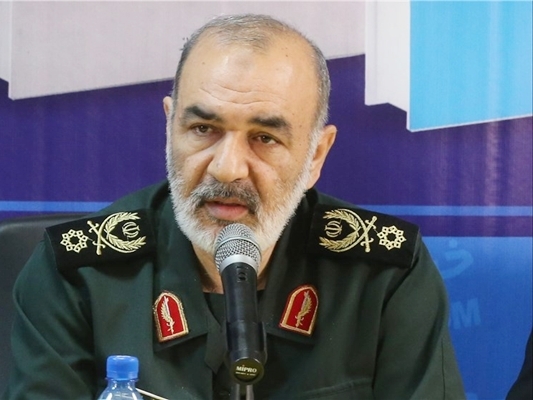 The IRGC’s second-in-command reiterated that the Islamic Republic of Iran will take a devastating revenge from the domestic and foreign elements behind the tragic attack of Ahvaz. He once again warned Saudi Arabia and the UAE to stop creating tensions in the region, adding that the two countries are not invincible. “You can’t sit in your glass palaces and remain safe against the retaliatory move of the Iranian nation. Our silence is deeply rooted in our revolutionary nobility. If you cross our red lines, we will definitely cross yours and you know well how sweeping would be Iran’s regional storm. So, stop meddling in the regional affairs because your regional ambitions have always ended up in failure,” he noted. The top commander then warned the US to stop sponsoring terrorism and said the phenomenon is against the interests of all states even the Americans. He said the enemies’ plots against the Islamic Republic have been hatched relentlessly over the past four decades, saying Ahvaz terrorist attack reminded the Iranians of the fact that to survive in today’s world, they need to remain strong against the arrogant powers.